It's Father's Day in the good ole' US of A, so this special Sunday post goes out to my Dad, the man who has always had my back and who was mainly responsible for influencing me in so many positive ways. 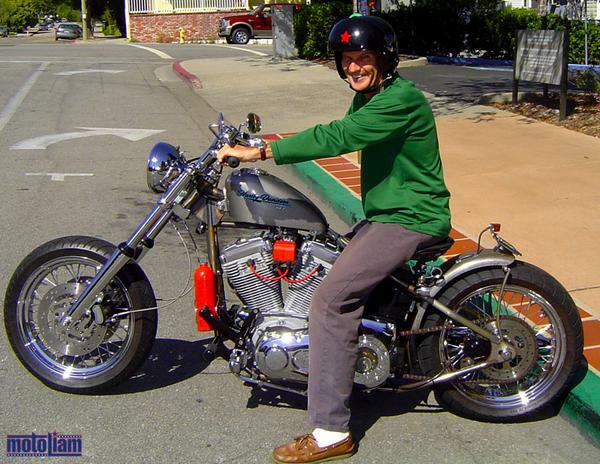 Here he is in San Luis Obispo, about to ride my hardtail for the first time. Just a week or so after I'd completed the bike after a frantic overnight build session in my front yard (they don't just happen on Biker Build-off! 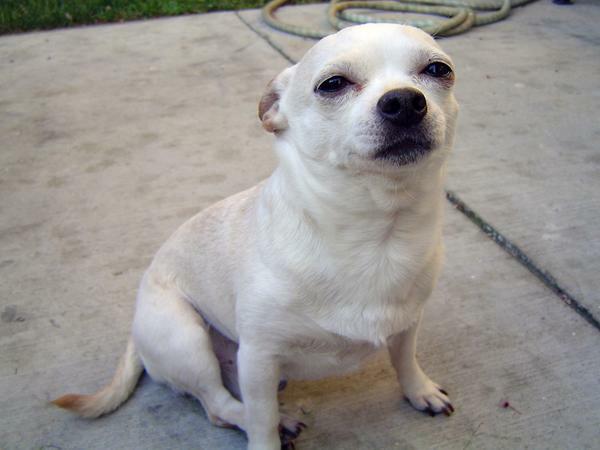 ), we made a plan to meet up somewhere between SF and LA. I'd wanted to take the bike on a proper shake down run, and a trip down south sounded like the perfect way to spend a weekend. Bonus that I would be able to have lunch with my Dad and brother, Thomas. BBQ! The bike handled the trip without a problem, cruising along at the ton with a steady throb that still reverberates in my chest to this day, the beating of the twin hammers pounding out the hundreds of miles. Handling was without question, as I sat arms folded like an indian changing lanes with only my feet in front of me and shifting my torso to compress either of the seat springs in the direction I wanted to go. The six speed was flawless, and some internal engine mods coupled with high flow heads and trick pistons made passing power a non-issue. God, I love tuning things! 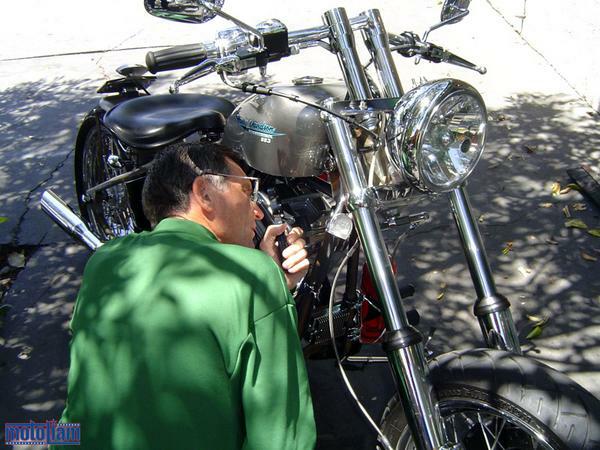 Once we'd all met up, my Dad started giving the bike a thorough once-over, his engineering background coming into play (like always). Dad scrutinizes the neck welds . . . . with a magnifying glass he just so happened to have stashed away in his truck, hahaha. 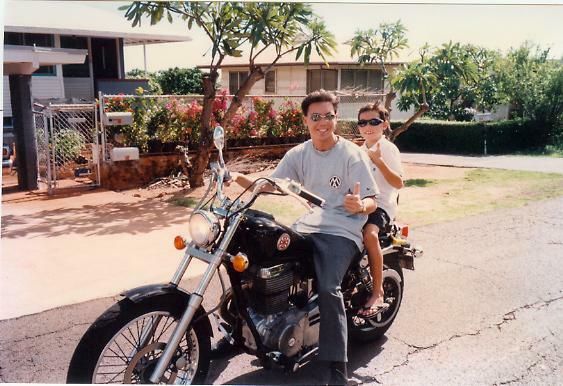 My Dad has always been behind my riding motorcycles. I never felt like it was something I needed to hide or feel strange about. One one of his journeys around the world, Dad rode a small bore two stroke motorcycle through France and down into Spain and Portugal. I believe that bike is now swimming with the sharks, having been ridden off a cliff into the Atlantic after she had seized one too many times. 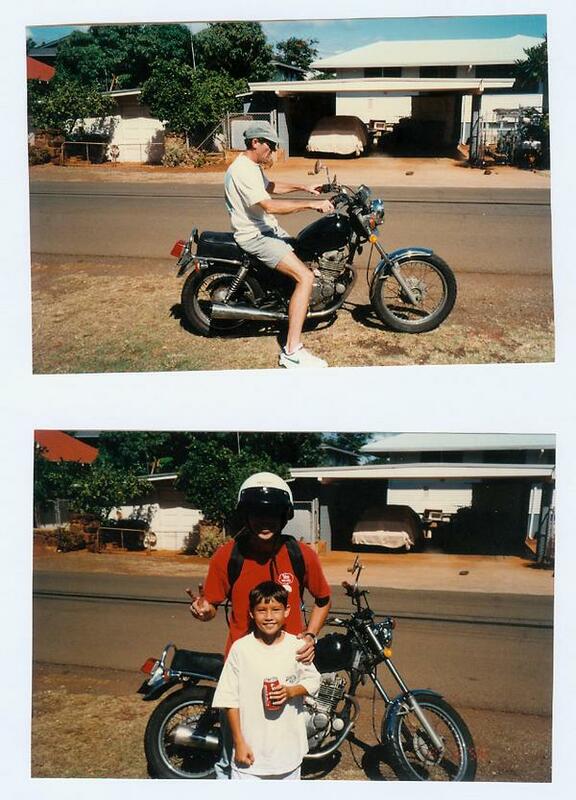 I remember riding up to my Dad's place in Kaimuki after I'd traded a mountain bike and 300 bucks cash for my first bike, a Suzuki GN250. Iterations of this machine are still in daily use throughout Asia, and for me, it was the perfect starter bike. Low power, poor brakes, shot shocks and leaky forks, it taught me to ride defensively and always on the limit - because that bike was always on the limit, hahaha. I don't know where that monstrous helmet came from, but I must have ditched it quite quickly because I don't remember ever wearing something like that. Hawaii doesn't have helmet laws, and after testing my head against the freeway asphalt one rainy night in Kaneohe, I'm a firm believer of strapping on a helmet. A few months later, I moved up to a Suzuki 650 single. 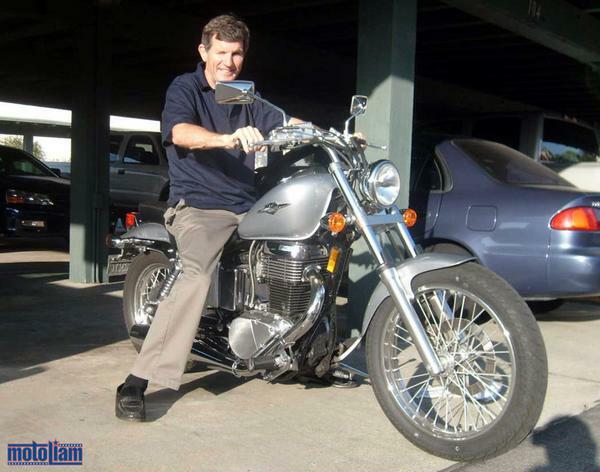 It was with this bike that I began working on my own engines, and it was here that I fell in love with Torque. I'll never forget the sensation of powering down the onramp from Waialae Avenue onto the freeway, the hair on my arms sticking straight up as I rung that baby for all she was worth. It scared the crap out of me, and it was only just the beginning of my quest for more power and especially more torque. Years later, and many bikes later, I was still obsessed with making power, this time in the form of hopped up mini-bikes. 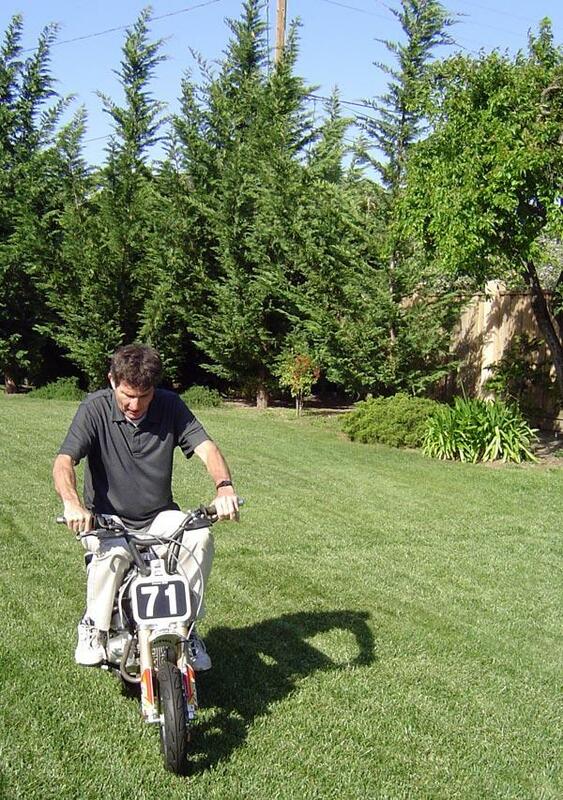 Here's Dad on my Fast 50s mini Supermoto in Sunnyvale. 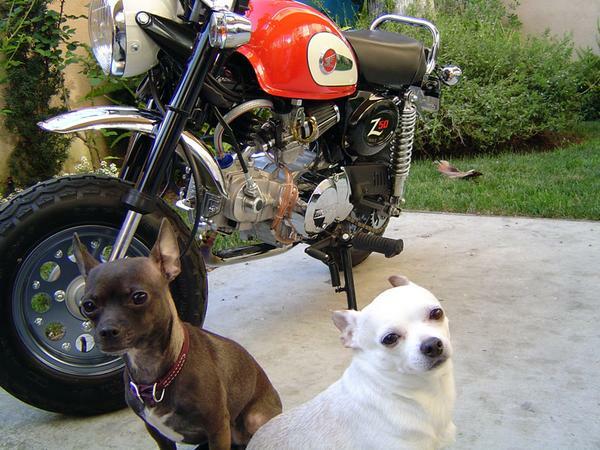 Since this is Father's Day, I gotta give a special shoutout to my dogs, Spike and Boba. They're living the high-life now, having "retired" to Hawaii when I moved to Europe. 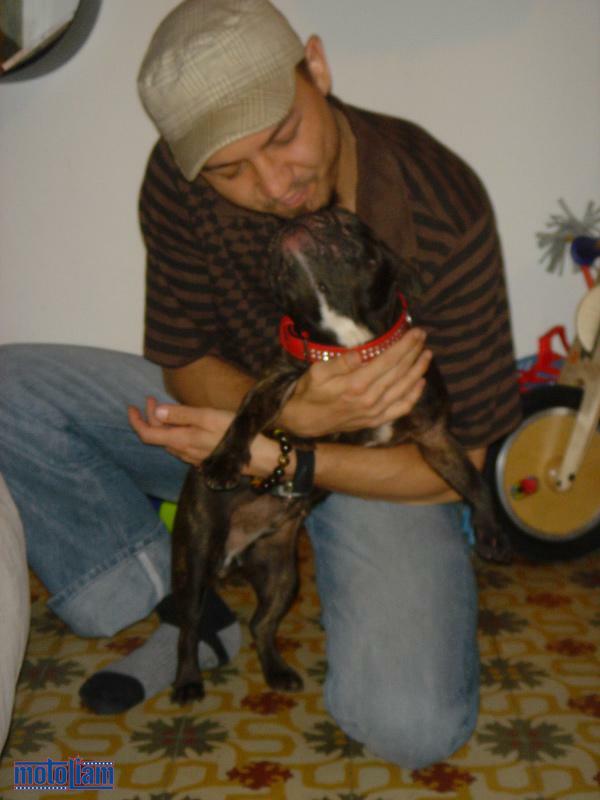 I never really understood how much I would miss their companionship when I decided to leave the states, and the added responsibility of knowing that I needed to head home after work to walk them, or wake up earlier to walk them, well, it was a good thing for me. There's nothing so satisfying as just laying around taking a nap with your dogs, haha. 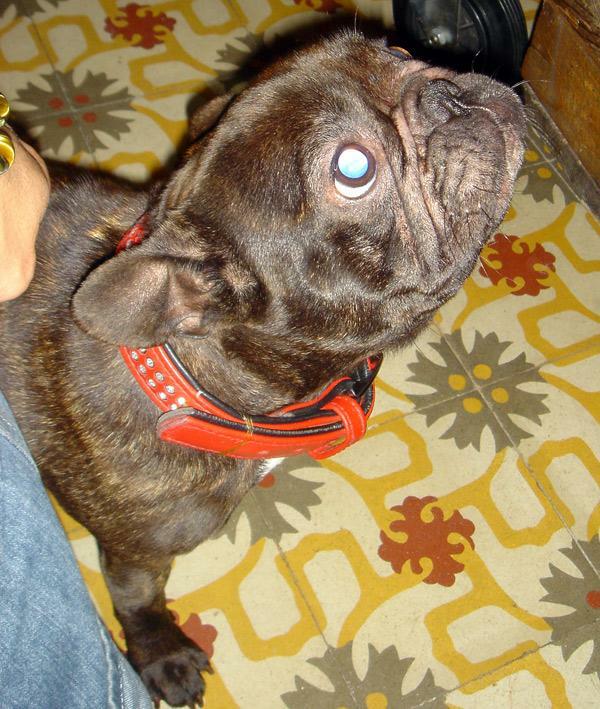 Just this past weekend, I made a new friend in the form of this gorgeous two year old French Bulldog named Mara. I was over at my friend Eugene's place, having a group dinner, and this snuffling little beast wouldn't leave my feet alone. Snort, snort, she sounded like me sleeping - while she was wandering through the house! I had Chinese take-out for the first time since I've been in Europe, and surprisingly, it was great! Wuffle, wuffle, Mara couldn't get enough, and with everyone else being predominantly vegetarian my duck and bamboo must have smelt delectable! 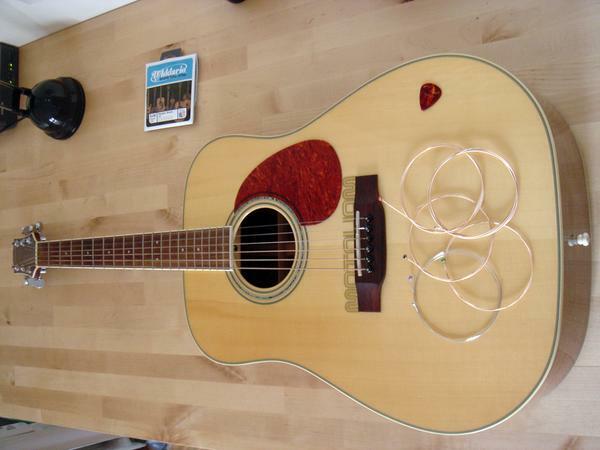 This weekend I finally strung up my guitar with some fresh cords. New strings, new voice! I'd been meaning to learn this song for a while, but it pales in comparison to the original, which I'd first put on the website back in the summer of 2006! My Dad taught me the basics of how to play guitar, and somewhere buried away in my mom's house back in Hawaii is a box filled with old, important paperwork from my high school years - including the yellow, legal-sized piece of paper that Dad drew out the seven standard chords for me to study. My Dad taught me so much when I was a child, showing me how to saw through wood that he would use to make me a step stool so I could reach the sink and brush my teeth, to hand crafting a custom miniature boom so that I could go windsurfing. I can't forget sanding the bamboo we used to make it, for hours and hours! We come full circle now, like all things in life. As my father had walked through Barcelona in his youth, on his travels and adventures, so have I. Dad didn't just stop here, though. From England, he travelled inwards through Europe, passing Italy, crossing Yugoslavia by bicycle, down through the Middle East, overland through Pakistan and India, across Southeast Asia, and eventually meeting my mother in Singapore. His travels didn't stop there, though, his work as an international engineer taking him to Perth and Mebourne, Hong Kong, and even all the way to Hawaii. I don't feel like I've seen and felt anywhere near as much as him, as he's been through more countries and states throughout the US than I (and in that late 60's early 70's era! ), but if you're going to have a role model, it might as well be someone who did it all, and did it right. Here's to my Dad for being fearless and free! 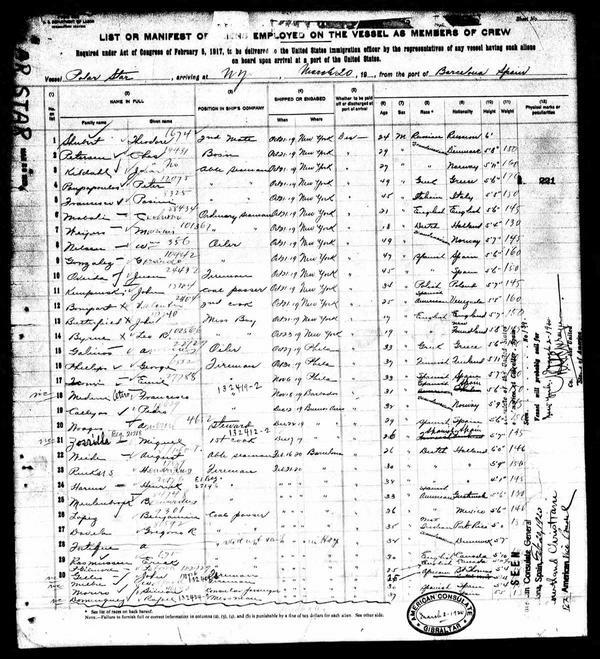 This immigration document from March of 1920, stamped by the American Consulate of Gibraltar, shows that my grandfather had shipped in to New York City as the second mate on the Polar Star. He's listed as Russian, 24 years old, and he shipped there out of BARCELONA, Spain. Three generations of explorers, three generations of my blood having crossed the oceans (Mom, too! 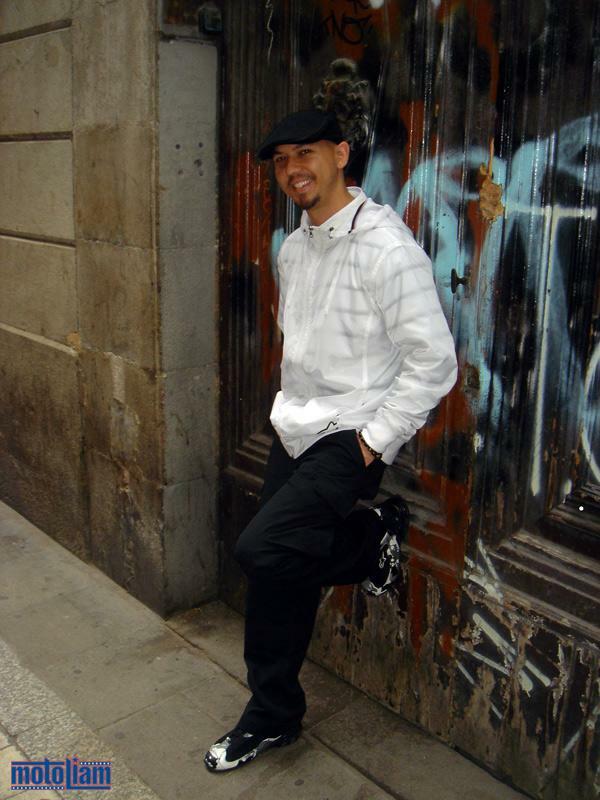 ), three life paths that have seen all the Shubert men walk up and down the Ramblas, breathing deep of the cultures we have been fortunate enough to experience. I never got the chance to meet my grandfather, as he passed on while my Dad was still a boy, but he raised a great man and a great father, and I'll always be thankful to him for that. It's only fitting that my Dad rides again now, this time on his own 650 single. Dad, thanks for always being there for me and Thomas. Have a great day, and many more adventures, as we continue to walk our own paths making our dreams a reality. Thank you, for always being an inspiration. Here's one from the Old Collection! Ain`t that the ways it`s supposed to be? When the word Dad is synonymous with Awe? Excellent stuff Liam. Great pic of your dad, Liam!